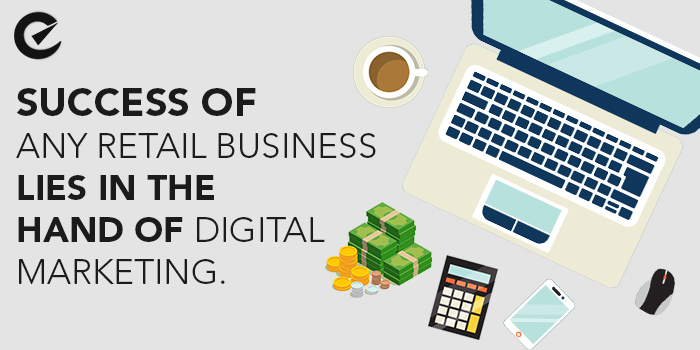 Success of any retail business lies in the hand of digital marketing. Digital marketing brings more business to a company than traditional marketing. Gone are the days when people went from door –to- door to let their customers know about their product. It was more hectic and had very less influence on the customer. With the introduction of digital marketing in the e-commerce platform, the marketing strategies of the retail industry transformed drastically. One, shouldn’t be hesitant to agree that digital marketing has profound influence on its customers than any other conventional marketing method. Now, let us discuss how digital marketing is creating an impact on the customers and bring more business to the industry. Digital marketing reaches wide range of customer in a short time- Recent research shows that around 80 % of the small and medium scale business is using Facebook as their platform for marketing their product. Earlier days, retail marketers had to wait for a customer to come to their shop and purchase their product. Digital marketing changed the scenario completely. Today business personnel can showcase their product to any customer irrespective of the geographical barriers. Also, advertising of product online is much cheaper than advertising them on print media. So, we can consider digital marketing to be cost-effective. Easy to influence the customers- With the increase of e-commerce trading, customers can easily do their shopping by comparing it with other products without even going to the shop. Nowadays, customers are less mostly dependent on word-of-mouth. Company advertisement has very less impact on them. Customer takes their purchase decision by reading reviews, feedback, and testimonials. In that way, they are more confident about the product they are buying. All this while I was discussing the positive side of Digital marketing. I won’t deny the fact that certain factors are there, which needs to be worked on for making it even more successful. Although small and medium scale business now can easily compete with large scale business in terms of reaching large number of customers online, many retailers are there who are still unable to understand their target audience, their preferences and requirements. Also, sometimes what happens the retailers advertise their product along with a message for the target audience, which gets misinterpreted and the sad part is that the marketers most of the time are unaware of this fact. Once, the wrong messages start spreading it cannot be taken back. But practically if you judge the things that you will realize that effects of digital marketing are more positive and less negative. Digital marketing has taken the retail business to a new altitude by bringing more customers, generating more revenues and gaining popularity which was very difficult to achieve by small companies few years back. Previous PostPrevious Clutch the stylish everlasting smartwatch with a battery that last years!!! Next PostNext You can deliberately earn money through “Facebook Research” app. You can hire resources directly from our pool of talents. We carefully assemble the team with the finest infrastructure needed. Your work will be done without you having to take the tension.